Lately, I'm finding myself hooked on the effects of masques and exfoliators; whether they be daily or weekly. I try to do a masque at least 2-3 times a week and finding the perfect products for my dry, sensitive skin has been a challenge throughout the years. What I've found is that some are either too drying, too greasy or don't even seem to work and left my skin in the same condition as before. I'm happy to report that I have found some great options that won't break the bank and can be found in most major cities in Canada. Enter - Lush Cosmetics and the Brand, Yes To. I have always been a big fan of Lush Cosmetics. I've been using their products since my high school days and love the natural oils and fragrance of their products. I can always count of them to provide a quality product that will do exactly what it says on the bottle. My first new gem from Lush is "Cup O Coffee". If you follow me on Instagram, you will know right away that I love coffee and death before decaf, is a real thing. This masque hybrid exfoliator, smells absolutely amazing that makes you want to use it every morning when you wake up. The texture is rich, creamy and super thick in consistency. I recommend using an old synthetic foundation brush to apply this type of masque. Because of the texture, it can be a bit messy and will make for an easier application with a brush. I leave it on for 15-20 minutes and recommend removing the masque with a wet, cellulose sponge. These guys you can find at any drugstore or skincare area, in most department stores. 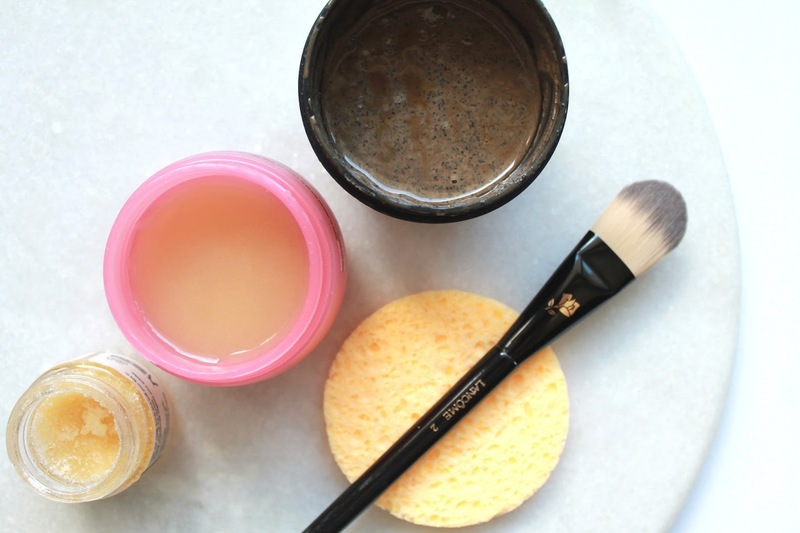 Once you start to remove the masque with the wet sponge, you will notice that it will start to rub into the skin and start the exfoliation process. The sponge keeps things easy and picks up every coffee grind, while rinsing away the masque. I notice that I need to rinse the sponge well in between certain sections of the face. This will ensure a quick and thorough removal. 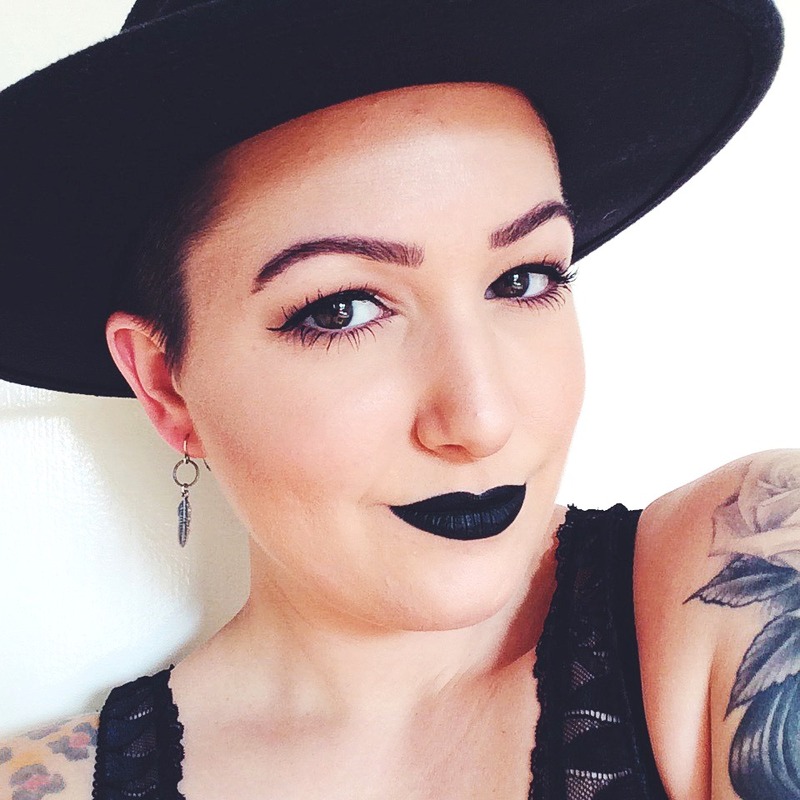 With all the liquid lipstick I wear, I find my lips (especially in the cooler months) get so dry and flaky. I have the kind of lips that peel easily and need a lot of hydration. Until this year, I never believed in using a lip scrub. Crazy, I know! I am true believer now since using the Lush lip scrubs. With them being all natural and the types of flavors like Bubblegum and Mint Julep, who doesn't want to do this beauty step everyday! My fave for the Summer has been Mint Julep. I love how refreshing and cooling it is.The power of mint is real on this one! 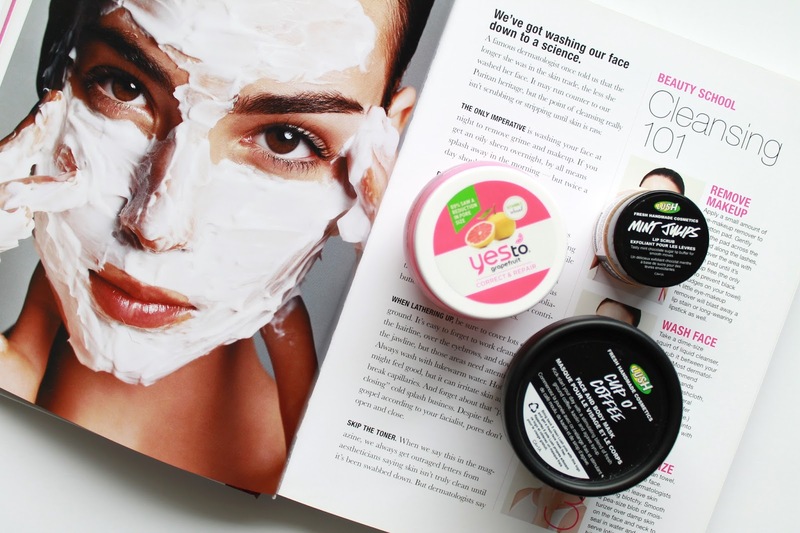 The last gem on this list, is the Yes To Grapefruit Pore Perfection Brightening Peel. I have seen the Yes To brand many times walking past, in the drugstore. I've never tried any of their products until this guy shined bright in my face. I was curious to try this peel like masque and see if all the product claims were true. Smaller pores and brightening? I was in. I have to say, I'm addicted to this stuff. My skin feels so soft, has never been so clear and it looks overall, less congested. I highly recommend you give this a try, if you're struggling to achieve a radiant glow and even skin tone. To say I'm impressed is an understatement.